I love finding a bargain in the sales but this year I've been questioning when and where will I actually wear it? Many a time I've grabbed an item of clothing thinking what a bargain only for it to hang in the back of my wardrobe with the tags on months down the line! When looking for dresses in the sales it's best to stick to classic shapes that flatter your figure rather than opting for a current trend that you may not wear this time next year. Choose colours you know will suit you. Now is a great time to pick up a dress for a summer wedding at half the price! 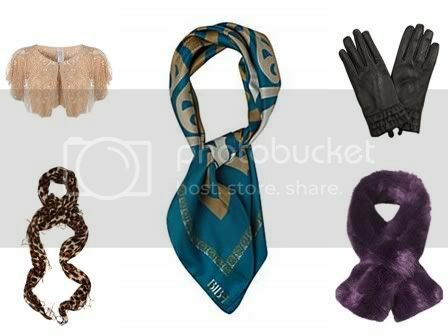 If you were lusting after a new pair of gloves or looking to add a bit of faux fur to your outfits this winter now is the time to find these timeless accessories at discounted prices. Statement designer scarves like the Biba designs are a versatile addition to any wardrobe and can be snapped up a reduced rate. Bags and purses are good investment pieces to find in the sales as you're sure to use them again and again. 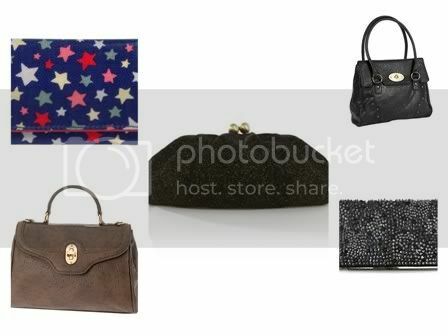 Many party clutches in the shops before Christmas can now be found at half price and will come in handy for events throughout the year. What do you look for in the sales? Have you found any bargains? Gorgeous accessories too, love the Oasis clutch! Haha yes sometimes a dress is on the sale rail for a reason! I love the bags you've chosen! I'm finding more bargains now that the sales have got their final reductions on - initially I was quite disappointed with the sales! I'll be posting a bargain haul post next week! The sales have been insane in the US, the stores are practically giving things away for free!!! Great tips, I'm currently living in Aus, so I get quite alot of benefit from the sales, what with the seasons being opposite and the fashion being quite behind here! Really good compilation of sale items! Somehow I always seemed to miss the sales-except for the sales at Pottery Barn and Victoria's Secret bc they constantly hound you to come in a buy stuff! *sigh* oh well-maybe next year. I agree about buying timeless dresses!!! I never get much during the sales, because I get frustrated with how messy everything is!! great pickes, love the red dresses! Hope you had great a New Year! Caroline! You're back! YAY! :) I love shopping the sales during this time of year because I find stuff I can wear all year round. I want that blue skater dress of sure. And that star wallet. So cute.